Spade bits for FRP boring, spade bits for wood boring, paddle bits, flat bits, boring bits, spade bits. Two different bits are shown below: one for FRP composite materials and the other for wood. 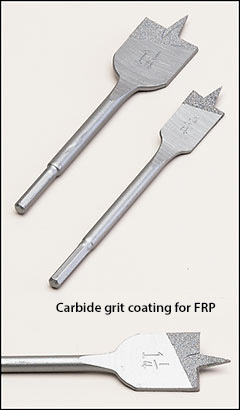 Spade bits for boring through FRP are coated with crushed carbide grit which is brazed onto the bit. 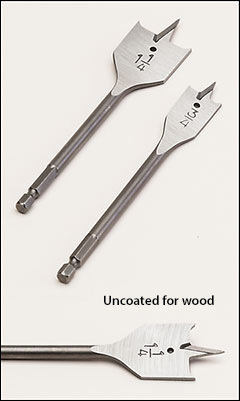 Other spade bits for boring through wood are not coated with carbide. These bits have a sharp centering point and spurs on the outside edge of the cutters. SAFETY WARNING: Make sure the maximum RPM of the bits you choose below, is more than the RPM of the power tool you are using. RPM of power tool cannot exceed (must be less than) maximum RPM of these items. Read, understand, and comply with the operating and safety instructions in the power tool owner's manual and the instructions for use of the accessory. Always wear safety goggles to protect your eyes, gloves to protect your hands, and other appropriate safety items recommended in the operating and safety instructions in the power tool owner's manual. Long lasting carbide coated spade bits work great drilling through FRP–up to 2" thick! These flat-blade spade bits make fast work of drilling through PVC pipe wrapped in FRP, transite, and other filled plastics. Used in drill presses and Mag drills for drilling flanges. Lean on handle, pull-up a few times to pull-out shavings, and it's like cutting through butter. These last long enough to be less expensive than resharpening carbide drills. Won't burn up like uncoated bits. Also called paddle bits or flat bits. 6" OAL. Cutting edge is hard tungsten carbide. Grooved point and cutting edges are designed for fast, clean boring. Flats ground on sides of the 1/4" shank, for use in 3-jaw chucks. They last long and don't walk as much as other bits. Recommended turning speed: 1500–2000 RPM. Maximum RPM: 2,500. Angled spur design cuts accurate holes cleanly and quickly with less vibration. Scribes hole before chip is made. Additional sizes are available between 1/4" and 1 1/2". Used to bore through wood, plastic, formica, and wood composites. 6" OAL. Flats ground on sides of the 1/4" shank, for use in 3-jaw chucks. Also works with 1/4" "fast-adapt" MQC14. Recommended turning speed: 1500–2000. Maximum RPM: 2,500.